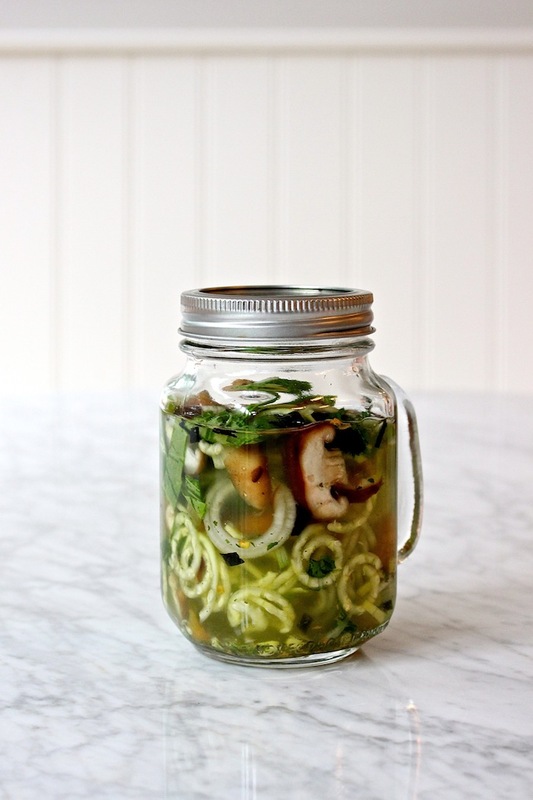 Last week, I had the TOTAL JOY of taking over the WHOLE30 recipe account for all seven days. And if you don’t already follow them, you should definitely head over now, because I posted over 20 recipes. All low-sodium and full of flavor. And all so easy that you could make them on a busy Wednesday. OR…even your office kitchen. Which brings me to the GENMAICHA MICROWAVE NOODLE SOUP. One of my favorite recipes from my new book, LOW-SO GOOD: A Guide to Real Food, Big Flavor, and Less Sodium. Which will hit stores and your mailbox next week!!! So order a copy today. Especially if you have a father-dude in your life who could use some more whole foods/smoked fish dip/beef roast/or BACON in his life. Or in other words, it makes the perfect Father’s Day Gift. 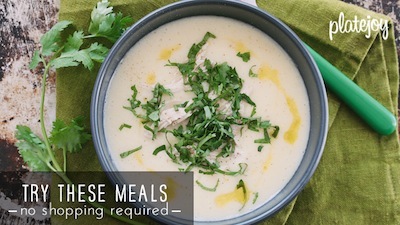 But back to this soup and your office microwave. 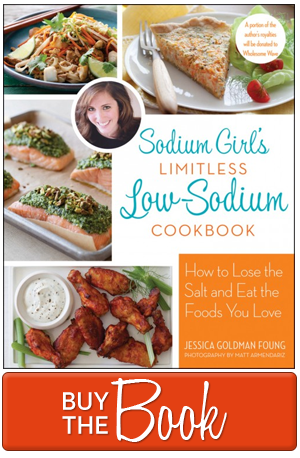 My main goal in writing this book (versus MY FIRST BOOK), was to give you tools to make and find and enjoy great low-sodium food wherever you might go. That includes your kitchen, weddings, dates, travels, and of course, work. Which often is one of the more difficult places to find low-so options because we either bring takeout to the desk or eat out with peers and clients, versus taking the time to prepare and pack something the night before. Don’t worry, though, because the answer does not (just) lie in prepping food on Sunday or making that big beef roast ahead of time for meals to come — although, that is a great solution, too. The easiest answer lies in coming up with better, low-so ways to use the few things your office kitchen may have on hand. Like, the almighty microwave. Just because a low-so requires ditching processed foods — including that high sodium ramen — it doesn’t mean you need to ditch the microwave for convenient work meals. With a few ingredients, a microwave safe container, and water, you can make a savory soup in minutes. The trick? Genmaicha, made from green tea and toasted rice, which contains natural umami and acts as a spill-proof, portable broth. Double win. And remember, you are the boss here. So use whatever you have on hand. Below I’ve suggested mostly raw ingredients for convenience. But you can also add cooked noodles and cooked proteins (like the extra bonus QUICKIE SHREDDED CHICKEN which is also in the new book, below). As well as other spices, fresh herbs, and types of tea (ginger!). With that, let’s get this soup party started. I’d love to hear what you decide to put in yours! Comment below! Send to friends who like sou. Or microwaves. Or lunch. And remember, order LOW-SO GOOD today so that it’s in your hands next Tuesday! And you’re eating better food by Wednesday. In the meantime, feel free to check out some other sneak peek recipes and GIVEAWAYS (and very sweet write-ups) by a few friends: The Recipe Renovator, The Healthy Apple, Weelicious, and the crew at Food52 (here, here, and here). More fun to come next week. Before work, pack everything but the water into a heat safe container or large mason jar with lid. Then, 10 minutes before lunch, add the boiled water to the container and let the tea bag steep for 5 to 8 minutes. 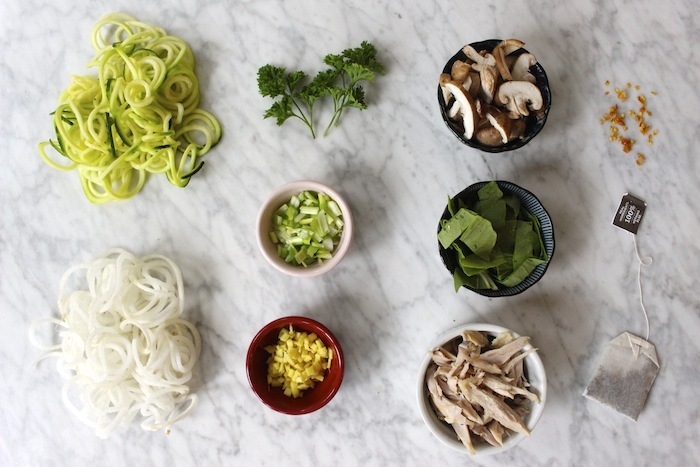 Remove the tea bag and reheat the soup in the microwave for 1 minute intervals until it reaches desired temperature and zoodles have desired texture. In a small bowl, stir together the spices. Set aside. In a large lidded saucepan or dutch oven over medium-high heat, add the orange juice, tomato puree, vinegar, and half of the spice mix. Stir to combine. Add the chicken and enough water to cover. Put on the lid, bring to a boil, and cook for 5 mnutes. Turn the heat to low and simmer, still covered!, until the chicken easily pulls apart with the tug of two forks, about 18 to 20 minutes. Transfer the chicken to a medium bowl and use the two forks to shred the meat. Or just use a knife to slice into thin strips. Add in the remaining spice mixture and 1/2 cup of the cooking liquid. Mix until combined. Store in an airtight container in the fridge for up to 4 days. And don’t forget to save (or freeze!) that cooking liquid to use like broth in a pot of beans, stew, rice, or even sauteed greens. 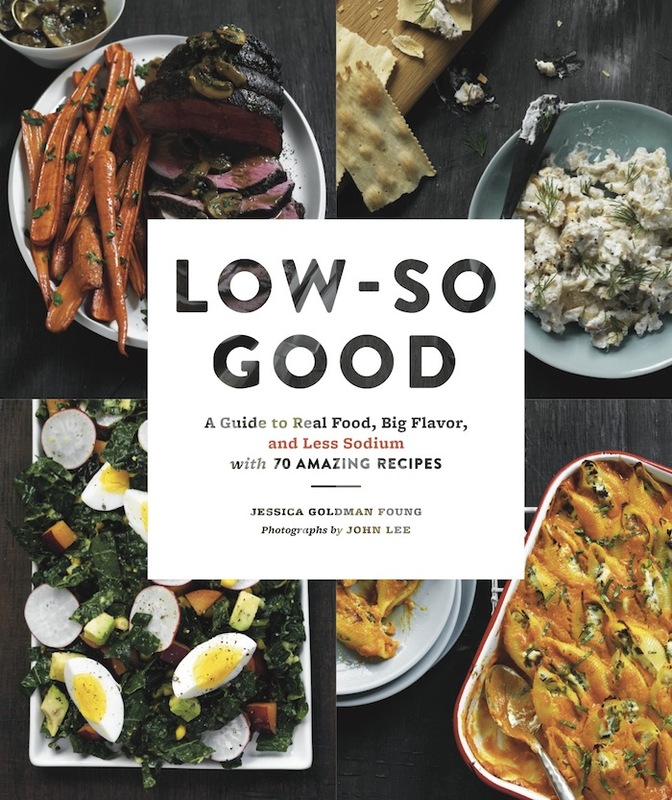 Next post: LOW-SO GOOD! And my Low-So Travel Pantry!